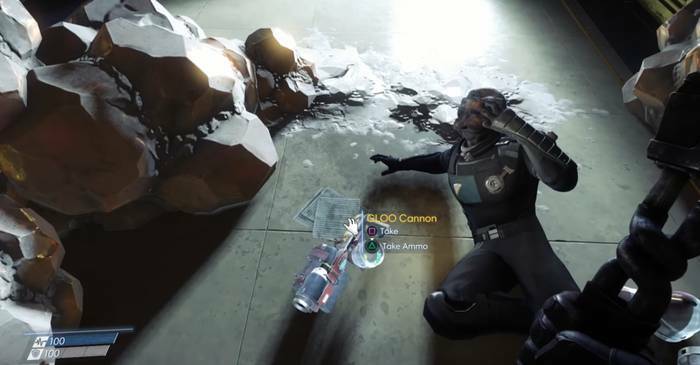 This is a Prey weapons page on the GLOO Cannon. Here you’ll find information about the weapons used in the 2017 sci-fi game, Prey. The GLOO cannon shoots glue that quickly sticks and hardens into concrete. It is a very handy weapon against the Typhon. However, it is not limited to pacifying enemies. You can also use the cannon to disable environmental hazards and create new paths into TALOS-I. The TranStar Gelifoam Lattice Organism Obstructur disables and/or immobilizes targets without harming them. GLOO can extinguish flames and temporarily stop electric arcs. When hardened, GLOO can also be used as a climbable platform. Holding the fire button will fire a continuous stream of GLOO. The GLOO Cannon is one of the most useful weapons in the game, able to freeze enemies (especially agile ones) to the point of helplessness which you can then finish off with certain abilities or another weapon of choice. Outside of combat, the GLOO Cannon can be used to patch up certain pipes of fixtures spouting flame or other dangerous substances, or even freeze moving machines during certain situations. The GLOO Cannon can be obtained in the hall leading to the Foyer during the Main Campaign Break Out. It will be next to a frozen mimic and a corpse of a security personnel (who presumably tried to neutralize it but was killed).